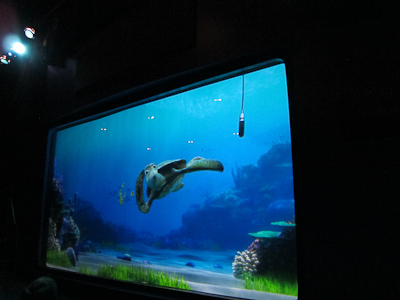 Heading over to the Mouse-Next-Door for a bit, I have to start with one of my favorite attractions, Turtle Talk with Crush. 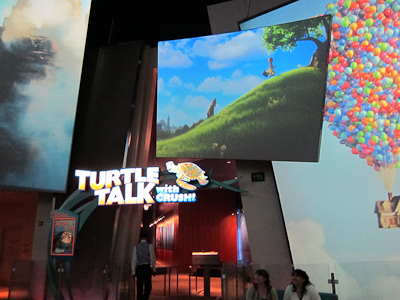 Located in the Hollywood Pictures Backlot, Turtle Talk is inside the Disney Animation building, and in my opinion is really one of CA Adventure’s hidden treasures. 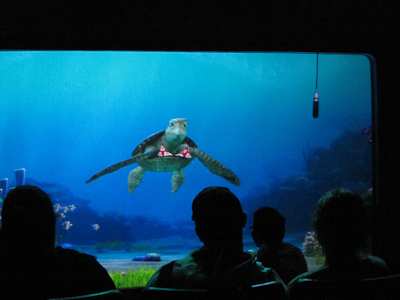 Turtle Talk is a show that takes place in a small theater. Theo just LOVES waiting and never has any energy to burn off–ha–so he kicked off the event by doing snow angels on the carpet. 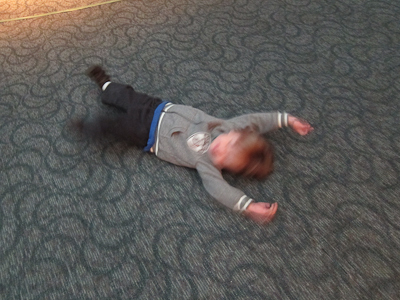 I know it looks like he was throwing a massive tantrum, but he really wasn’t. This time. And the place was practically empty, so while I’m not in general in the habit of letting my child make carpet angels on the floor, there was plenty of room for it, and the carpet looked quite clean. And let’s be honest here–I guarantee it gets vacuumed more than our carpet at home. All that dirt is good for the immune system. heh. 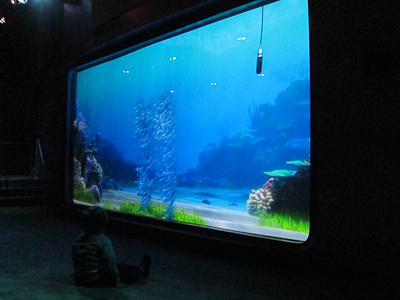 ANYway, at the front of the theater is the large screen, also known as the tank (or as Crush calls it, the human tank). 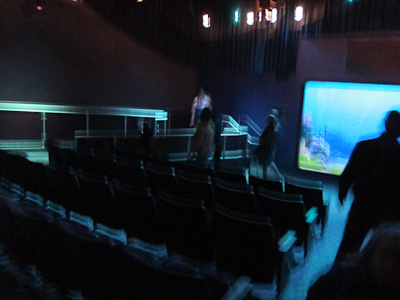 There’s theater-type seating and a nice, big spot on the floor for the kiddies. Like I said, it was basically empty. 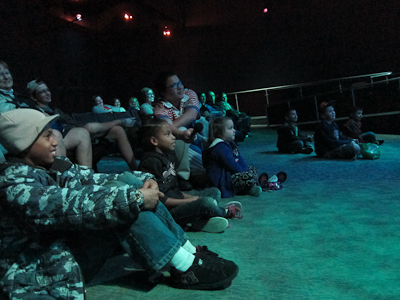 The cast member with the microphone also invited any adults to sit on the carpet, up to age 150. He did note that if you were 151 or older, you might have trouble getting up off the floor. Lucky me, I have trouble getting up off the floor at 38. But I was game. The gist of the show is this: the audience has a real-time conversation with Crush. Oh, by the way, if you live under a rock and don’t know who Crush is, he’s from Finding Nemo, a movie Theo has never seen but easily identifies. Anyway, first the moonfish come in with a few instructions. This was a formation of a knife and fork telling us not to eat in the theater. Also an example of excellent photo timing. Theo was already enchanted. Then Crush comes out and does some back flips and a few other fancy diving tricks. 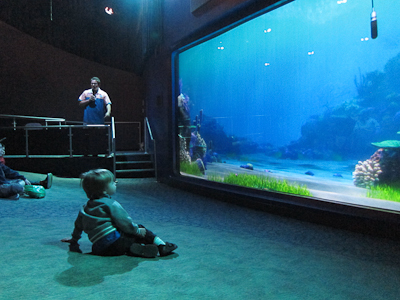 He taps on the glass of the "Human Tank." Crush then explains that he has a few questions (well, Squirt has a few questions) for the humans, and he wants to answer human questions about turtles. Crush also invites audience members to raise their hands and ask them questions, again identifying them by sight. The cast member with the microphone doesn’t choose anyone–Crush does! As I said, it’s a real-time conversation with virtually no lag between questions and answers. The animation and the dialogue line up perfectly with the conversation. I have some guesses for how it’s done (DON’T TELL ME IF YOU KNOW!!!) but the best part is just sitting back and enjoying the Disney magic. Also cool is Crush’s animated reactions. He has a number of different expressions. Partway through the show, Theo decided he needed to get up and sit in a seat rather than the carpet. Talk about embarrassing. I’ve officially become That Mom, I think. The one chasing her kid around looking like she has absolutely no control over what he’s doing. I guess it was better than him attempting some more carpet angels right there in front. Crush also has several comedy bits. In this one, he talked to a 6th grade boy and brought out a bikini, asking him was it was. "Dude, what is this for?" Which hey, go kid setting boundaries! Crush then got an expression of understanding and said, “Ohhhhhhhh, dude, I’m so embarrassed.” It was all quite fun. After the show was over, I intended to take a few pictures of the inside of the theater, just to give you guys a look around. But remember what I said about the out-of-control toddler? I think the entire Animation building is really worth spending some time in, especially when it’s hot outside. 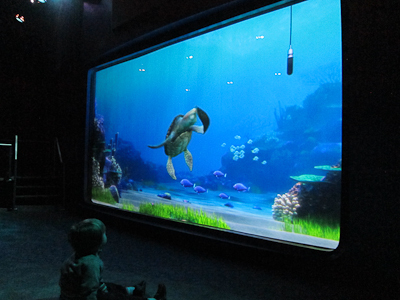 Turtle Talk is particularly great for the little ones. 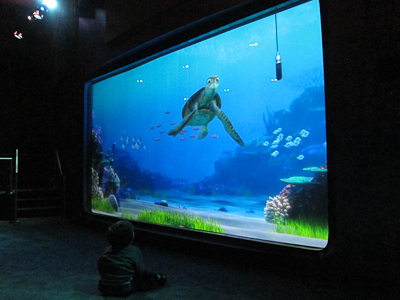 I recommend watching a short video from Turtle Talk here.